Metal ore nodes contain metal ore and high quality metal ore. 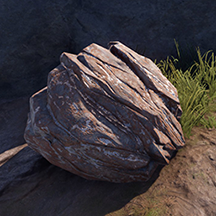 Ore Nodes are most commonly found around cliffs, mountains and other rock formations. Due to this they are scarcely found in open fields. When using a Salvaged Icepick hit the node on a normal bit, then hit the hotspots afterwards. This will destroy the node in 5 hits rather than the usual 6. This works with Sulfur Ore Nodes as well, but not Stone Ore Nodes.